When it comes to corals in tropical waters, good news is hard to come by. Battered by global warming and pollution, these fragile creatures, and their ecosystems, are increasingly under threat of mass bleaching worldwide. Australia’s famed Great Barrier Reef may be doomed, and Malaysia’s own stunningly beautiful reefs, which are true natural wonders, are more and more exposed to environmental stressors that place their very existence in jeopardy. But then, now and again, there’s some good news. A case in point is a report published in Biosphere Editions and called “Paradise in Peril: Studying & Protecting Reefs within the Tioman Archipelago Marine Protected Area.” According to the report, reefs at Pulau Tioman, a scenic island popular with divers in Johor, are holding up unexpectedly well (at least for the time being) despite warming sea waters and other threats like man-made pollution. However, not all is well at the reefs of Tioman. Several forms of marine life “continue to be either absent, or were recorded in very low numbers throughout all survey sites,” the authors note. The culprits are warming waters caused by man-made climate change and the deleterious effects of untreated wastewater being released from island communities directly into the sea. 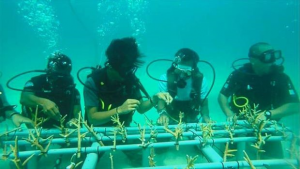 In addition, locals continue to defy a no-fishing rule at the reefs and carry on denuding the corals’ fragile ecosystems of their inhabitants, thereby further endangering the health of the island’s reefs. “[I]llegal harvesting of marine life along with increased development on land continue to be the main threats to reefs around Tioman,” the authors note. Sadly, such wanton destruction is par for the course elsewhere in Malaysia as well. 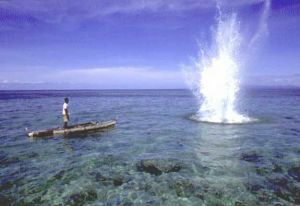 According to another recent report, more than two-thirds of reefs at the Semporna Priority Conservation Area (PCA) have been damaged, to varying degrees, by fish bombing, a practice whereby fishermen use explosives to stun or kill fish, often at or near reefs. 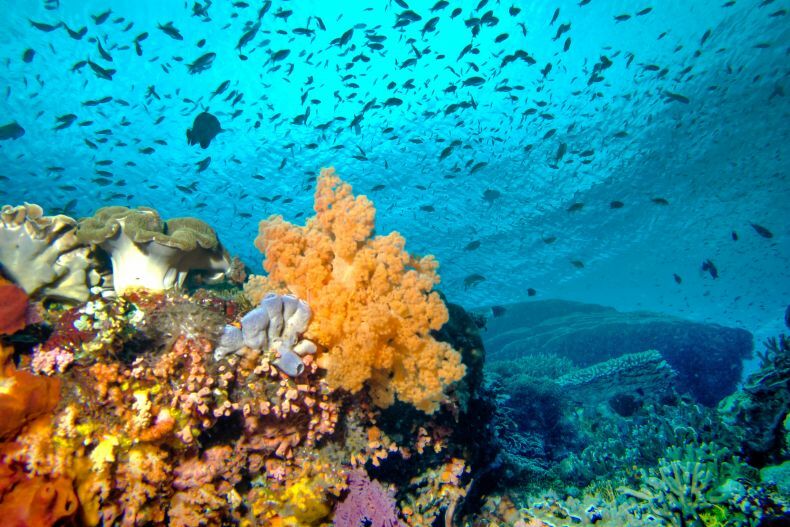 “More than 50 per cent of the reefs are impacted badly, namely in the high and very high categories, by fish bombing activities,” said Choo Poh Leem, a conservationist at WWF-Malaysia. “However,” she went on to explain, “the most severe human impact to the northern reefs is the trash or general human waste, especially Palang-Palang site from Bum Bum island, where the local inhabitants live adjacent to the reef.” But we can’t just blame locals. Tourists are likewise responsible for lots of trash that end up in the sea at popular marine areas. So there you have it: even if you think you would never do anything to harm corals, you might still do so simply through negligence, such as by littering. Do-it-yourself conservationist projects that seek to raise awareness can play a part in helping restore Malaysia’s beleaguered reefs. Take this one, for example: A team of environmentally conscious volunteers from Care Luxury Hotels and Resorts has been replanting a certain type of coral in the waters around Tunamaya Beach and Spa Resort on Tioman Island. By promoting responsible tourism, the resort seeks to maintain the precarious ecological equilibrium in its marine environment. 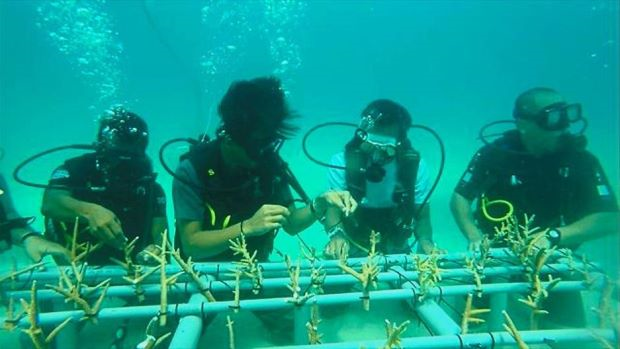 “Our main effort is aimed at restoration and rehabilitating the coral reefs, and at the same time we can also educate our guests on ways to protect our diverse marine eco-system,” the project’s leader observed. Exactly. No matter how resilient corals and other marine lifeforms may be, they can do only so much to withstand man-made stressors and regenerate in the face of pollution, blast fishing and climate change. We need to give coral reefs a chance to bounce back by being far more circumspect in our actions. We must stop polluting and littering. And we must also start reducing our carbon footprints, individually and collectively.